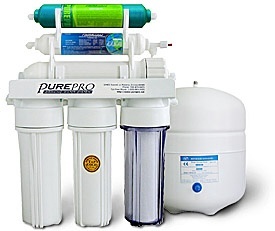 PureProR EC106-Alkaline is a super quality 6 stage filter system comes with PureProR USA Alkaline Filter, to offer the very best in water filtration and balanced pH water for drinking. Using reverse osmosis technologies with alkaline filter can actually remove 99.99% of contaminants and provide people with healthy alkaline drinking water. Produces perfectly ph-balanced alkaline water, helps minimize the fluctuations of your body's pH.